During their 18 year tenure, Deerhunter have taken a deconstructionist approach to their art. It might seem as if the Atlanta indie rock band had abandoned the gleaming abstractions of their early work for impeccably crafted pop music, but doing so was as much of an experiment as it was their more challenging work. After what many believe to be their creative apex, from 2010's Halycon Days to frontman Bradford Cox's solo efforts as Atlas Sound, they began to structure their albums with a more genre-specific template. Though they never implied that they never were in dire straits, the departure of Josh Fauver after Halcyon Days did pose new creative challenges for them as a functioning band. Why Hasn't Everything Already Disappeared? marks their third album since they regrouped, and setting aside the individual merits of both Monomania and Fading Frontier, it's the first where they provide a clearer understanding of how they function during their second phase as a unified piece. That is not to say that they still work in slightly unorthodox ways - given how the rest of the band can't commit on a full-time basis through the writing process, it's Cox who assumes full control and leadership over the album's conceptual thread. But despite this agreement, it's what they each bring to the project that makes, rather than breaks, their compositional interrelationship possible. Deerhunter's collaborative amalgamation of crafty tunemanship and harmony goes at odds with the bleak outlook they otherwise present in Why Hasn't Everything Already Disappeared? Recorded in Marfa, Texas, a remote desert city that has attracted free thinkers and voracious consumerists alike - from high-end designers like Prada to canonical filmmakers like Win Wenders - they sought to find another angle to reinvent their latest rockist identity. They perfectly encapsulate this state of mind on the video for album opener Death in Midsummer, where a frazzled Cox and his bandmates split the difference between alien researchers and affected fashionistas. But Midsummer is also uncompromising in its tone, an ominous kickoff to an album which poses genuine concerns about our current state of affairs. These concerns are implicit and more artful in design, not meant to rattle any specific political viewpoints, more so an exploration of where we might end up if we choose to take a destructive path. Much of Why Hasn't Everything Already Disappeared? sounds like an underexposed film, developed with a grainy, analog sound. From start to finish, Cox views a distant apocalypse through a glass darkly as if writing up a travelogue of his findings. And as he progresses, he makes nihilist claims to invite us into his presence - "In the country/there's much duress/violence/is taking hold/follow me/ the golden void," he steadily sings on No One's Sleeping, which otherwise sounds like he's performing an indie rock song with a harpsichord (cordially provided by writer/producer Cate Le Bon) for mutants at a Western saloon. Whereas in Element, Cox flaps his lips with a cool swagger as ornate strings beautify an otherwise acerbic melody whose fringes are alluring, yet sharp. It's in how Cox balances raw instinct with careful attention to detail where he manages to write songs that sound imperfect, yet authentic. The temperamental shifts in Why Hasn't Everything Already Disappeared? give it a cold, distancing effect, as they incorporate offbeat sounds that seem influenced by electronic composers like Delia Derbyshire. But there's still that punchy quality that gives them a pop framework - take the instrumental Greenpoint Gothic, where drummer Moses Archuleta bashes a series of drum fills over an array of spooky synth lines. And on late-breaking single Plains, they infuse some of the sweltering energy of their performance of Living My Life for Stephen Colbert with a bouncy, Talking Heads-like eighties sheen; but upon closer inspection, it's the billowing synth work that elevates the vigorous two-minute track. 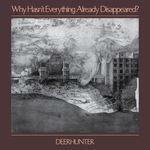 Tonal changes aside, those worried if Deerhunter have stepped away from their feverish art rock needn't worry. Futurism is one of their most sparkling tracks to date, as it enjoys one of those chromatic guitar riffs (accomplished with the assistance of White Fence's Tim Presley) they've been writing since their Microcastle days. And then there's the piano-led chug of What Happens to People?, a meditation on what it means to lose your goodwill which possesses one of their most textured soundscapes - Cox channels some of the languid allure of Nico from a performance standpoint, a more subdued, yet comparable take to the tight musicianship of fan favorites like Desire Lines and Nothing Ever Happens. There's something oddly bewildering about how Deerhunter subvert their wailing guitars with a muted, if classicist, technique.